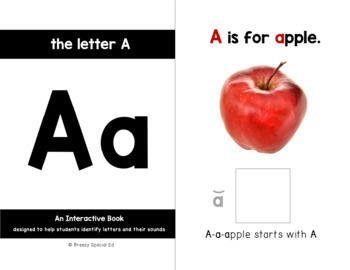 This set of 29 ABC books is perfect for students working on learning and recognizing letters and their sounds. Repetitive text means that students can learn how to read each book, even if they can't actually read the words yet. 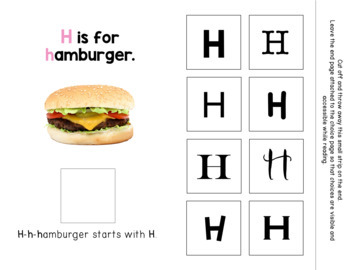 And there are lots of options to practice saying each letter sound on each page! 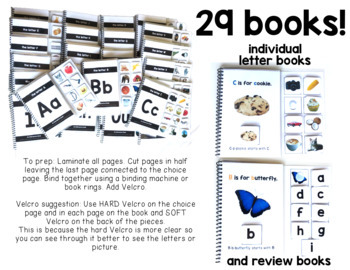 26 Letter Books: 1 for each letter with 8 pages/pictures for each letter. 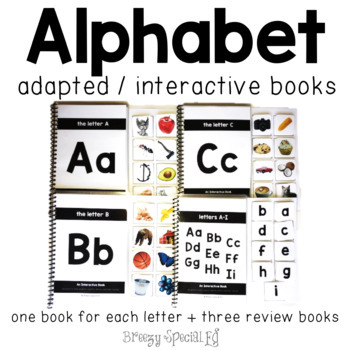 3 Review Books: Review books that go over all 26 letters (combined). Students will match the letter to each page. • The text is predictable so that students can learn and read the books on their own. • Level 1 (Errorless): Students take picture off the page and put onto of the letter on the back choice page. • Level 2 (Picture match): Students take the picture off the choice page and match to the correct picture on each page. Prep these books using lamination and velcro! This resource is perfect for special education and autism classrooms, and early childhood education! ✎ Follow me on Facebook and Instagram for lots of great ideas and sales! ☞Love adapted books? Check out these sentence starter adapted books here.